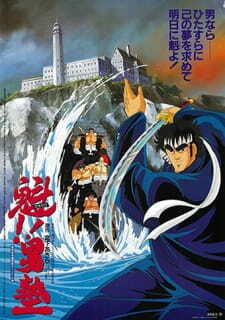 A short film on a underrated manly battle shonen, Sakigake Otokojuku The Movie serves as an introduction to the series. The film's plot is straight to the point as we have our leading characters embark on a journey to America to participate in the tournament known as Great Battle August. Half the film is an outrageous road trip while the 2nd half are 4 rounds of 1 on 1 fighting. Not much can be learned from the characters by the movie alone aside from expressing manliness & the friendship they all shared on this short adventure. The only flaws to this film are the anti-climatic final fight & the lack of other main characters such as Date Omito & The Three Fists. (Same goes for Akashi Gouji who only gets a brief scene in the movie). But like the Otokojuku series, expect some last second rescues as characters miraculously survived their deadly encounters. Overall the film is great especially with its soundtrack that yells "awesome 80's!!" Like most shonen films, it merely has the beat up the bad guy scenario, but has its own flair as we follow the students of Otokojuku taking on various over the top challenges & will stop at nothing to succeed as they follow the spirit of Otokojuku. OSU!! When Does This Movie Take Place In The Timeline Of The Series?